As candidates in the general election focus on making themselves known to voters, the latest school finance ruling provides their clearest marching orders yet. The higher courts, of course, could change everything, starting with that deadline — the judge ordered the state to put remedies in place by July 15 of next year. If the Texas Supreme Court is quick, school finance could be the centerpiece issue for the new slate of statewide officials coming into office next year, and for the 2015 legislative session. Then — or later, if the courts operate at normal speed — those state officials will be up against what might be the central tension in politics and government: The balance of what people want and what they are willing to pay for it. In his relatively brief opinion —backed up by almost 400 pages of legal findings — Dietz said the state put its school districts in an impossible position, like hiring someone to mow a lawn with nothing more than scissors and a rake. That’s essentially what the school districts said when they sued the state — that the system violated the state’s own constitutional standards for the quality and fairness of public education. Again, the higher courts might disagree. And the Legislature is under no orders to wait; lawmakers will write a budget next year that includes a school finance scheme whether the final word on this lawsuit is ready or not. They’ve been told that at least one judge thinks the local school property taxes have once again morphed into an unconstitutional state property tax, which is what you get when the state tells you what services need to be provided and then caps the amount of money you can raise to get it done. This has happened in school finance before. When enough districts find themselves taxing at the top rate permitted by the state— that is, when their discretion over their own taxes is effectively gone — their local property taxes effectively become a state-set tax. That’s only one piece of what the Legislature has to consider. Dietz ruled that the state has set up a financing system that prevents it from proving “a constitutionally adequate education for all Texas schoolchildren,” and goes into some detail about which kids are being short-changed. That “general diffusion of knowledge” language is in there, too — that’s from the state Constitution, and Dietz ruled the state is falling short of providing for it. Finally, he said the system is unfair because it doesn’t get the state’s poorer areas sufficient money to keep up with the richer areas. As a legal matter, this is just a resting spot. 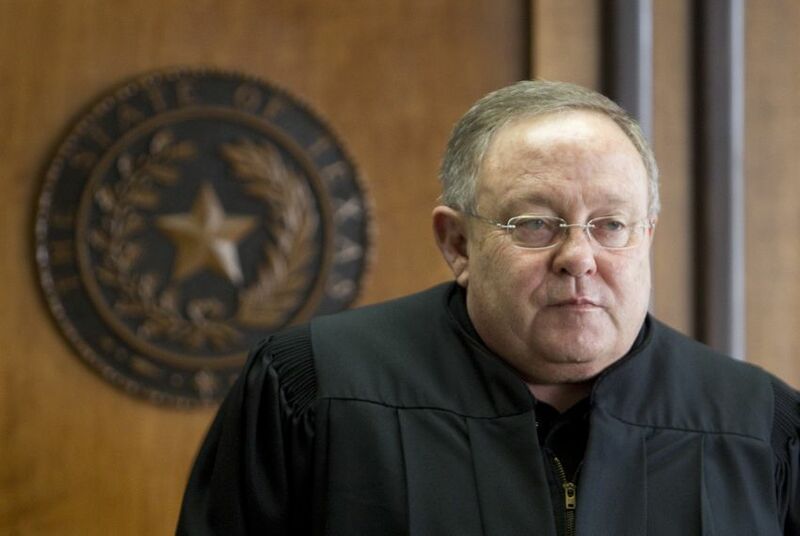 The state is expected to appeal, directly or eventually, to the Texas Supreme Court, a process that could take a lot of time and produce a much different ruling than what Dietz rendered last week. As a political matter, it already has Democratic gubernatorial candidate Wendy Davis prodding her Republican opponent, Attorney General Greg Abbott, to drop the appeals, let Dietz’s ruling stand and get to work on the remedies. Abbott, as the state’s lawyer, is in the potentially awkward position of defending a school finance system he did not vote for or sign into law. But it was put in place by a Republican Legislature and signed by a Republican governor, and Davis and other Democrats leapt to align themselves with teachers and students against a parsimonious state government run by the other guys. It also gives Davis a chance to play up her first big filibuster in the Senate, an effort to draw attention to more than $5 billion in public education cuts included in the budget written in 2011. There is the other side of the debate, however. Public education is one of the biggest expenses in the state budget. Property taxes are high enough in many places to be a motivational irritant to voters. And the connection between another dollar spent on education and a higher score or a more prepared student is not a straight-up “If you do this, you will get that” equation. Most voters want the state to have terrific public schools. Most of them want to keep as much of their own money away from tax collectors as possible. Most politicians want to keep those voters happy, and to do that, they have to find the balance between excellence and price. That’s always the situation in government, but now there is a deadline.